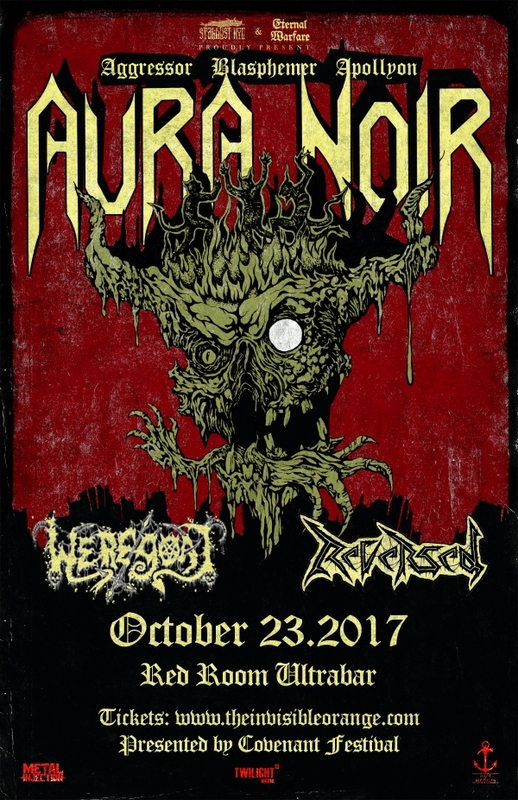 "For the first time in twenty-four years, Norway's AURA NOIR will tour North America this October with its original virulent formula: Aggressor, Blasphemer and Apollyon." Sons Of Hades promises to be one of the wildest black metal tours witnessed in a long, long time. Support will come from Vancouver's favoured sons of total death and depravity WEREGOAT and REVERSED debuts their chaotic prowess. 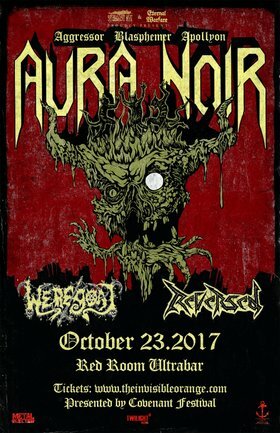 AURA NOIR formed in Oslo in 1995 as a result of Aggressor and Apollyon's frustration with the metal underground’s trends and fads. They saw a gap that needed to be filled with something real, something metal. They intended to create a band that combined influences of 80s luminaries such as Sodom, Celtic Frost, Venom, Voivod, Dark Angel etc. Thus, black thrash metal was born. WEREGOAT Black/death metal from Portland Oregon. REVERSED Debuting their chaotic prowess, REVERSED lurches forth from the Covenant inner circle to give Vancouver a never before seen level of mania.